Watercolor painting has a long history in the West, with watercolor associations such as the Royal Watercolour Society (est. 1804) and the American Watercolor Society (est. 1866) having been in existence for several centuries. But Taiwanese watercolor painting has had a short lifespan in comparison. It was not until 1906, when the Japanese painter Ishikawa Kinichiro began teaching watercolor painting in Taiwan, that the art form arrived on the island. However, traditional Chinese ink painting, which like watercolor painting, uses water as a mixing medium, has been practiced for over a thousand years; its power, and its significance as a basic form of cultural nourishment for the Chinese people, cannot be overstated. In the East, a mere few decades of experimentation with watercolors have yielded rich and striking results, creating a unique style of watercolor painting with Chinese or Eastern characteristics that is well worth our attention. Because of the island's colonial history, Taiwan has been the site of much cultural mingling and overlap, creating a diverse, variegated culture that can be difficult to pin down. 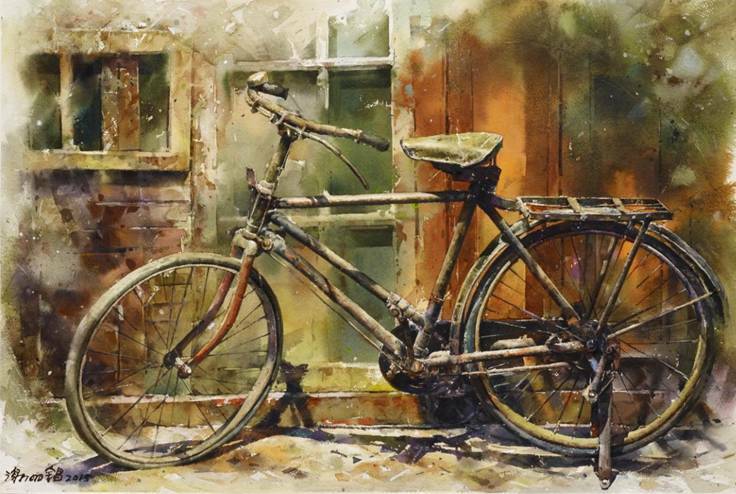 During the early development of watercolor painting in Taiwan, it became common for watercolorists to paint realist scenes taking inspiration from Taiwanese village life and people. "Taiwan's Second Tallest Mountain" by Ishikawa Kinichiro, "Green Lake" by Bai-Shui Ma, Shiy-Der Chin 's "Boat near Orchid Island," and In-Ting Ran's "Duck Farmers" are examples of works by the older generation of watercolorists, depicting the people and places of Taiwan in a true-to-life fashion, that are masterful and worthy of admiration. The 1970s native art movement created a new wave of interest in local culture, which had a great influence on the younger generation of painters, inspiring in them esteem for their home soil that has persisted up to this day. This exhibition examines the influence that a handful of older, master watercolorists exerted on the development of watercolor painting in Taiwan. By comparing older and newer works by representative painters of the 1970s, exploring the changes in their styles and visual vocabularies, introducing viewers to a new generation of up-and-coming artists of the "Second Golden Age of Watercolor," and examining the differences between the first and second "golden ages," the exhibition aims to create an authentic portrait of Taiwanese watercolor painting over the past century. Jointly organized by College of Humanity, National Taiwan University of Arts, Chinese Asia-Pacific Watercolor Association, College of Art, National Taiwan University and the Taipei Cultural Center in New York, this exhibition received support from the Taiwanese Ministry of Culture.